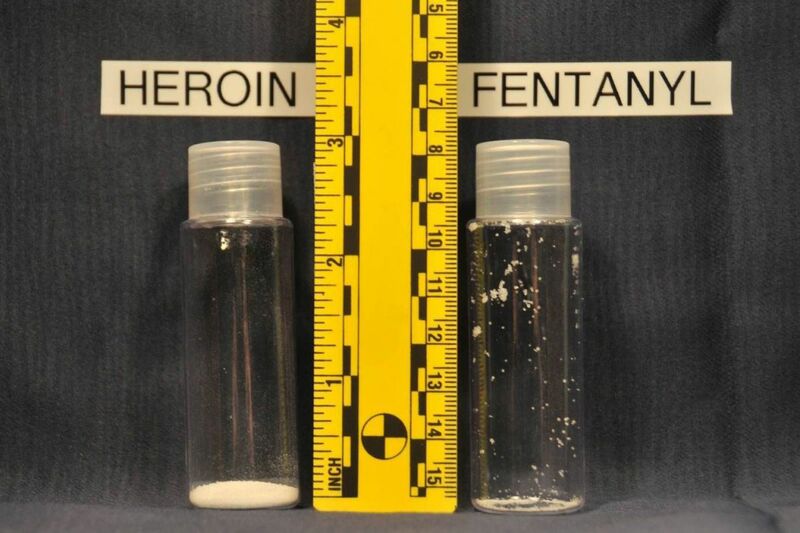 A side-by-side comparison of fatal doses of heroin, right, and the synthetic opioid fentanyl, shows that the latter is much more powerful. Two drugs with opposite effects — cocaine and the synthetic opioid fentanyl — are contributing to more overdose deaths in Philadelphia. Cheap, potent fentanyl — which can be 10 times stronger than heroin — has long been found in heroin, often with fatal consequences to people who sometimes don't realize they are using fentanyl. Both of those opioid drugs, like prescription painkillers, are depressants that slow down messages between the brain and the body. Cocaine, however, is a stimulant that speeds up the system. Exactly why fentanyl is turning up in cocaine overdose cases is unclear, though law enforcement and public health experts have come up with several theories. There's no doubt, though, that fentanyl has created a new unpredictability in the drug supply that's proving increasingly fatal. "As we see this expansion of fentanyl and fentanyl analogs into the drug supply, the universe of people who might be at risk is much broader," said Christopher Jones, the director of the National Mental Health and Substance Abuse Police Laboratory at the Substance Abuse and Mental Health Services Administration. "That's why you see the really significant spikes in overdose deaths since 2015." In a paper published last year, Jones noted a national spike in cocaine-related overdose deaths between 2000 and 2015 — and that opioids appeared to be behind it, with more people overdosing with both drugs in their system. In Philadelphia, 280 people overdosed with cocaine and opioids in their system in 2016. More than half of the time, that opioid was fentanyl, according to the medical examiner's office. By June 2017, 262 people had overdosed on a combination of cocaine and opioids, and 85 percent of those deaths involved fentanyl. Whether or not drug users realize they're ingesting that combination of drugs — generally a powder that is snorted or dissolved into a solution and then injected — is unclear. Speedballs, the colloquial term for a heroin-cocaine combination, have long been a popular drug cocktail, used together for what is said to be a unique euphoria. But a report issued to agents of the U.S. Drug Enforcement Administration in January indicates that at least some people in addiction may be using — and dying from — the deadlier cocaine-fentanyl combination. Of more than 30,000 cocaine samples from Pennsylvania that the DEA analyzed between 2015 and 2017, less than one percent contained fentanyl. But the number of samples that tested positive for fentanyl jumped 112 percent between 2016 and 2017, investigators found. And more than half the samples with fentanyl also contained heroin. The DEA has theorized that a larger-than-average supply of cocaine in the area — coupled with a lower demand for that drug — may mean that cocaine is making its way into the heroin supply. Investigators also looked at evidence from 73 death scenes where victims had overdosed on cocaine and fentanyl. About half of the scenes showed evidence of heroin use — syringes, stamped heroin bags, Narcan (the overdose rescue drug) — but not cocaine. Twenty showed evidence of only cocaine use. "While it is not possible to conclusively associate drug paraphernalia with drug usage," the report reads, "scene evidence analysis supports the suggestion that heroin users may be purchasing cocaine and fentanyl packaged and sold as heroin." Some accounts from drug users appear to support that theory: A woman from Northwest Philadelphia, who has been using heroin for 20 years, said in an interview with the Inquirer and Daily News that last year she bought a bag of what she thought was heroin. But blood work later showed she had been ingesting fentanyl and cocaine — neither of which she had sought out, she said, declining to be publicly identified because of a prior relationship with a dealer. People in addiction could also be seeking out cocaine and heroin separately — but, instead of heroin, winding up with the deadlier fentanyl, the DEA wrote in last month's report. Even street dealers, the DEA said, are often unaware of what's in the product they're moving. "People may not be aware of fentanyl being present [in cocaine], or they may assume it's not there, and mix it with heroin that also contains fentanyl," said David Metzger, an addiction researcher and director of the HIV/AIDS Prevention Research Division at the University of Pennsylvania. "It speaks to the fact that we need to talk to drug users more and more, and learn about what their perception is of what they're buying." Jones said fentanyl has added a deeper complication to the overdose crisis. "We have to think about the universe of people who might be at risk besides people who are knowingly using opioids," he said. "Law enforcement has to share information about what drugs are in the drug supply locally and give that information out to the public. People are using substances and they largely don't know what they're getting."